Fluid balance is a big concern when your kidneys can no longer regulate fluids. Adhering to your fluid restriction is a difficult task, no doubt about it. And yet, following your fluid restriction is very important and can help you to avoid irreparable health hazards. Excess fluid can cause swelling of feet, hands and face, as well as high blood pressure. It can also cause fluid to collect in the lungs, producing difficulty breathing and fatigue. Long term non-adherence to your fluid restriction can cause the heart to lose its elasticity (like a worn out rubber band). When this happens, it cannot do its job of pumping blood throughout the body. This damage to the body carries with it the increased risk of hospitalization and death. Individuals may have different fluid restrictions based on their specific condition, but for most dialysis patients, the fluid restriction is 1000 ml which is equal to 4 cups or 32 fluid ounces. If you have chronic kidney disease (CKD) stages 1-4, your restriction may be different, as determined by your doctor. Regardless of how much your restriction is, one thing is for sure. If you do not measure your liquids, you will not know how much fluid you are taking in. You could be drinking in excess of your fluid restriction without realizing it. Measuring your liquids is key to adhering to your fluid restriction. A fluid is anything that you can drink, including water, coffee, tea, juice, milk, supplements, broth and soda. Ice, gelatin, and sherbet are also considered as liquids because they melt at room temperature. One cup of ice melts to 1/2 cup of water. Sucking on ice to quench thirst, although may not seem like much, can still add up in your daily liquid intake. Minty and sour flavors tend to decrease thirst while sugary and salty flavors will increase thirst. Maintaining blood sugars within range, if you have diabetes, and avoiding salty or processed foods will also help to decrease thirst. Target weight is the weight that the doctor has prescribed for you to weigh when you have completed your dialysis treatment. Knowing your target weight is very important. Your target weight may change as you gain or lose real weight, but it won’t fluctuate from day to day. Ask your dialysis technician for your target weight if you are not sure. This will insure that when you weigh yourself before and after your treatment, you know if you are carrying excess fluid. Generally speaking, if you come in to treatment 2.5 kg above your target weight, this may mean that you are coming into your treatments with fluid excess. Ask your doctor about individualized fluid weight goals. And when you have completed your treatment, if you do have excess fluid (1 kg or above your target weight) the way to get back to your target weight is to drink less fluid in between your next treatment. Being in excess of your target weight is like being overdrawn at the bank. You need to pay that money back sooner or later to get back to even. Just like you would spend less money to balance your account, drink less fluid in between treatments to reach your target weight. And, just like being constantly overdrawn at the bank, constantly being in excess of your target weight carries heavy penalties. So stay within your fluid budget to help avoid penalties on your health. 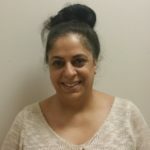 Rasheeda Mustafa, MS, RD, CD-N has been a dietitian for 18 years, having worked predominantly with the geriatric population in long term care, short term rehab and home care. She has worked with DaVita almost 2 years, currently practicing in Bronx, NY. What she enjoys best about working in renal is the experience of learning a completely new aspect of nutrition as well as the camaraderie that she shares with her new colleagues and the interactions she has with her patients. Her previous background was in the food service industry, having attended The Culinary Institute of America and working in high end restaurants for such notable chefs as Emeril Lagasse. She enjoys travelling near and far and has been an avid practitioner of yoga for 12 years. I have read in the DaVita forums that it is very difficult to maintain your ideal fluid intake. I am stage 4, but not on dialysis yet. This article on the weight was very helpful to me and it actually made me sit down and figure out if I was adhering to my nephroogist’s recommendations; I’m happy to say that I am so far. thanks for a great article!